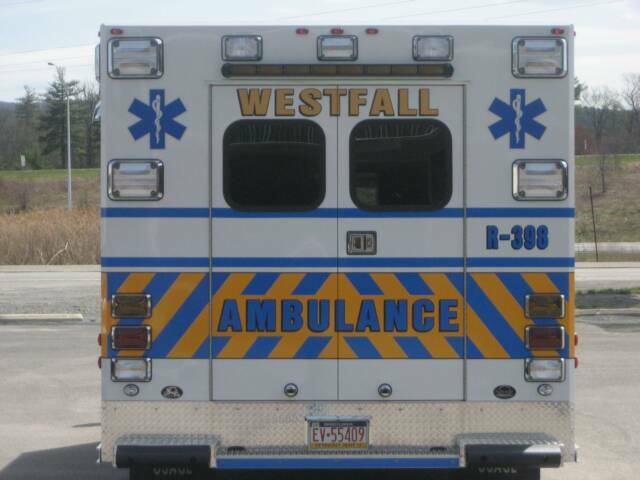 4/18/09 - WESTFALL TWP - After months of hard work, the members of Station 39 welcomed the addition of a new 2009 Osage Super Warrior Type III BLS Ambulance. 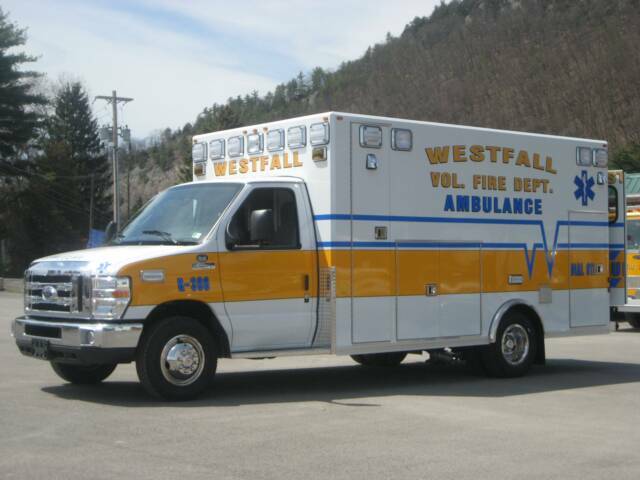 The new Ambulance is built on a Ford E-450 Chassis and is equipped with a Whelen light package as well as a Stryker rugged Stretcher and Stairchair. The ambulance will go into service after receiving radios, equipment and PA DOH State inspection. 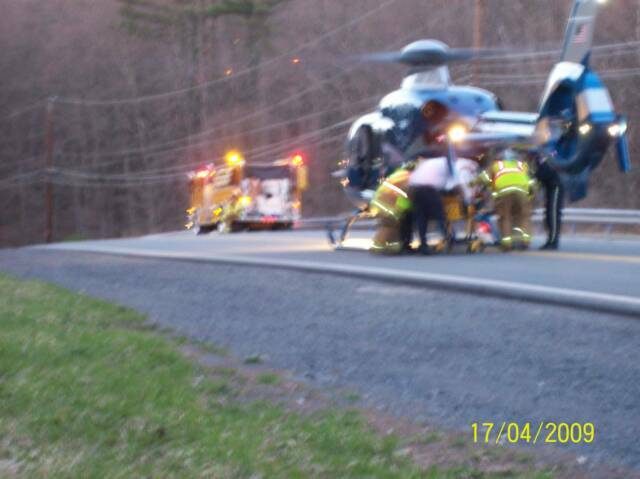 4/17/09 - WESTFALL TWP - At 18:57 hrs, Both Fire Station and Squad 39 were dispatched to a Motorcycle Accident with unkown injuries on Cummins Hill Rd. 39 E2 and A-399 as well as Regional ALS arrived to find a motorcyclist with head injuries. Medevac 2 out of Stroudsburg was requested to the scene. 39 E1 secured the LZ along Cummins Hill Rd. All units returned to service at 20:00. 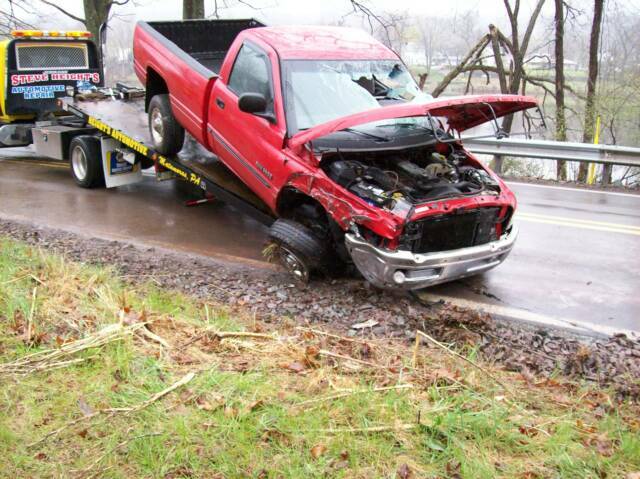 4/21/09 - WESTFALL TWP - At 07:41, Both Fire Station & Squad 39 were alerted for a Motor Vehicle Accident with possible Haz-Mat on Delaware Drive near Garden Court. As 39 Engine 2 and A-399 went responding, the PC-911 Center advised of a truck rolled over near the riverfront possibly leaking pesticides. As units arrived, a scene sizeup revealed that a lawn contractors pick-up containing small quanitites of fertilizer overturned and no active Haz-Mat. EMT's from A-399 began assessing the 2 occupants from the vehicle who sustained minor injuries while E-2 contained fluids in the roadway and assessed a damaged utility pole. All units returned to service at 09:41hrs. 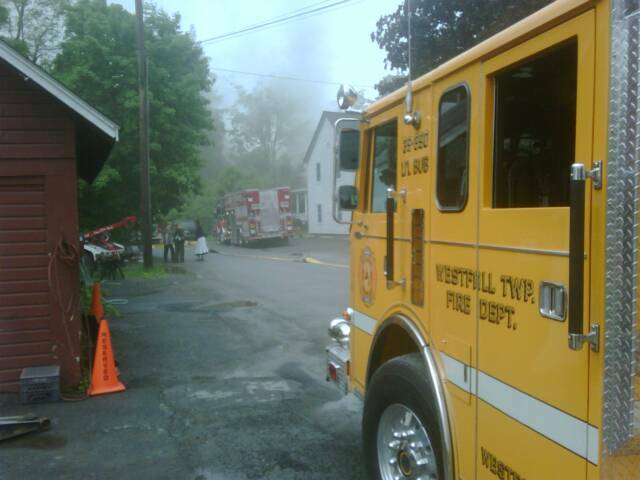 5/27/09 - WESTFALL TWP - At 10:25, Squad 39 along with Squad 34 Q.R.S and Medic 403 were alerted for a Medical Emergency in the Hamlet of Mill Rift, Westfall Twp. This emergency response would mark A-398's first run since going into service earlier that day. This pictures shows A-398 at the Bon Secour Hospital Emergency Room. 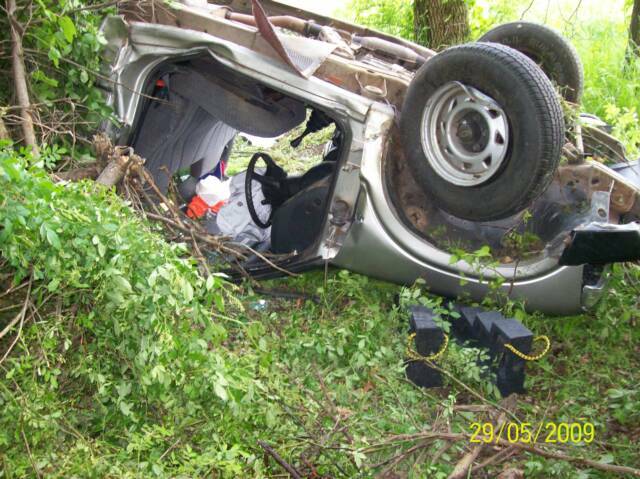 5/29/09 - WESTFALL TWP - At 14:57, Both Fire Station & Squad 39 were alerted for a Motor Vehicle Accident on Interstate 84 near Mile Marker 52 westbound. 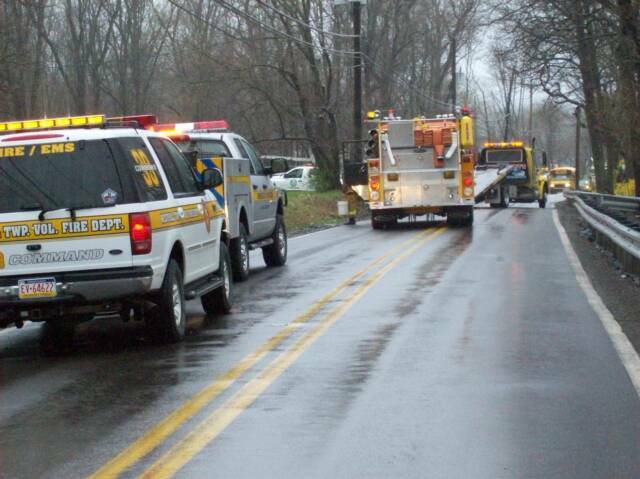 As 39-1 (Chief Koferl) went responding, the PC-911 Center advised they were receiving multiple calls reporting a pick-up truck overturned with entrapment. 39-1 arrived on scene confirming the dispatch and updated 39 Engine 2 and A-399 that the vehicle was off the roadway into heavy brush and the driver was unconscious and still trapped inside the truck. Command requested Medevac launched and 32 Engine to establish a landing zone on the Interstate and 32 Rescue to assist with extrication. Shortly after the patient was extricated, Command was notified that the Medevac cancelled due to mechanical problems prompting a ground transport to a local hospital by A-399 and Regional ALS. All units returned to service at 16:10hrs. 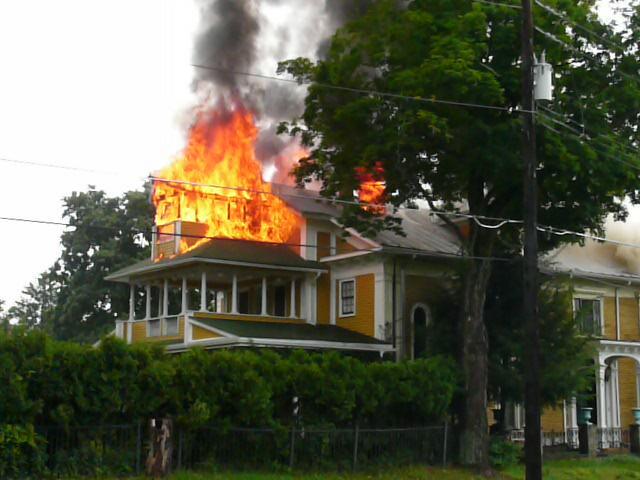 6/9/09 - MILFORD BORO - At 10:13 hrs, the Milford Fire Department (Station 33) was alerted for a possible structure fire on James Street in Milford Borough. Shortly after dispatch, Milford Police arrived on scene and reported smoke from the eaves of a building that was earlier struck by lightening. At 10:20 hrs, 33 Command requested 39 Engine 1 to relocate to Station 33 and within minutes, Engine 1 was upgraded to the scene as well as numerous other agencies for a confirmed fire on the top floor of a historic 3 story church that had been renovated into apartments. On arrival, Engine 1 supplied an LDH line to 33's Engine while the personnel positioned handlines up to the fire floor. Shortly into the fire, 39 Tanker was also requested to the scene to assist with shuttling water after units operating on scene experienced hydrant problems. All units returned to service at 17:49. Sparrowbush Engine and Lumberland Tanker stood by at Station 39 during this incident. 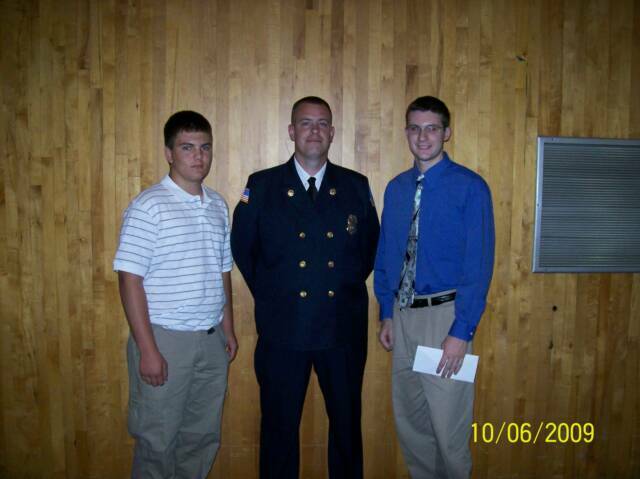 6/10/09 - WESTFALL TWP - The Westfall Fire Department proudly presents the 2009 Irving Hulst Memorial Scholarship to Vinny Cordova & Scott Gillette. Both are 09' Graduates of DVHS and volunteer firefighters. 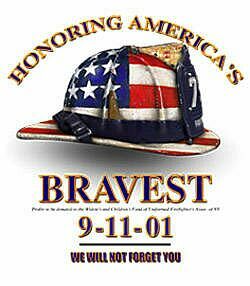 Vinny (Westfall FD) will be attending Bloomsburg University majoring Science and Scott (Matamoras FD) will be attending Sussex Comm College majoring in FIre Science. Congratulations all of the DVHS 09' Graduates.